Fortnite Vending Machines are live right now in the Battle Royale mode of the popular game, as part of update v3.4. In this Fortnite Vending Machine Locations Map guide, we’ll be going over everything we know so far about the new feature, as well as all the gear items Vending Machines can potentially offer you. 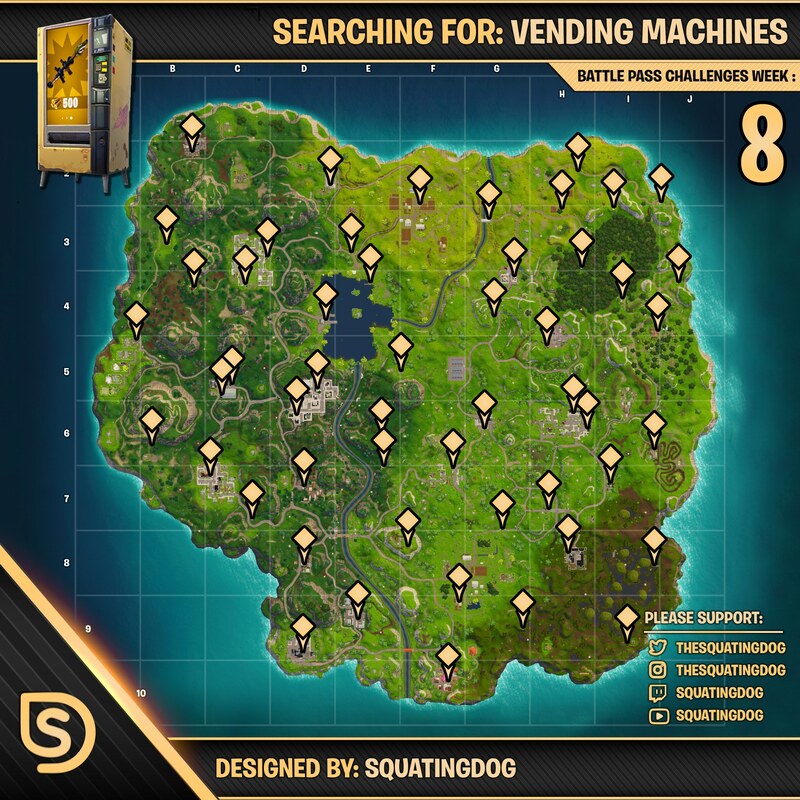 Vending Machines are also part of the Fortnite Week 8 Challenges, with the task being to use a vending machine. With the vending machine locations below, this challenge should be easy. If you instead need anything else to do with the massive game of Fortnite, including how to get better at the Battle Royale mode, as well as how to find the best weapons scattered around the Battle Royale map, make sure to head over to our complete Fortnite guides hub. Earlier this week, at the start of April there was a bug going round for some Fortnite players, that caused the mysterious Vending Machines to appear in-game for those affected. Epic was quick to remove the feature from those affected, but not before it was noted by the Fortnite community at large. 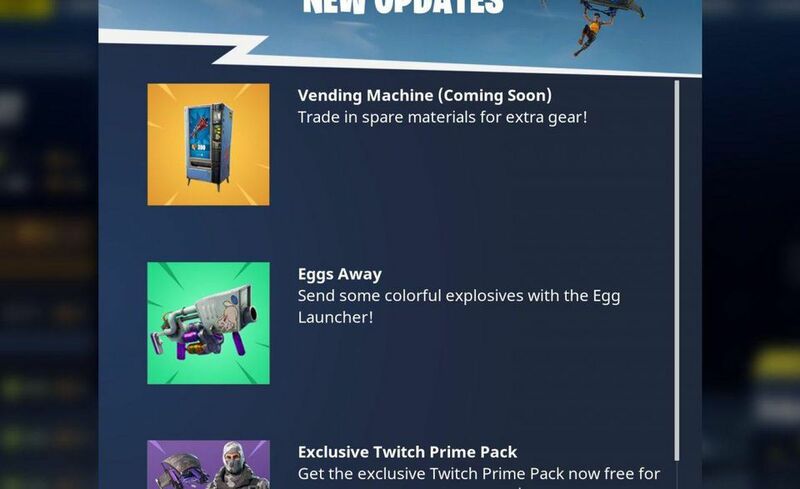 But Epic then outright released the Vending Machines for Fortnite just a few days later, on April 4. Fortnite Vending Machines are active in the Battle Royale version of the game, having been implemented in content update v3.4. They can be found in random locations all across the Battle Royale map, and once assigned to a location, they'll randomly select a level rarity, and offer items at corresponding rarity level. There's a strong indication that the Fortnite Vending Machines could function as part of the upcoming Week 8 Challenges for all Battle Pass holders, if a leaked schedule is to be believed. Head over to our Fortnite Week 8 Challenges guide for all you need to know about the upcoming slate of tasks. Just below, you can see the comprehensive map of Vending Machine Locations in Fortnite Battle Royale, which comes straight from FortniteIntel. This map shows all the Fortntie Vending Machine locations we know of. We'll leave this here as a work in progress for now, but should we uncover any more solid information surrounding potential Fortnite Vending Machine Locations, you can read about it here straight away. Just below, we've got a list of all the confirmed weapons that we've seen be offered by Fortnite Vending Machines. The materials listed next to the name of each weapon indicates the rarity that they were offered at, so for example the Tactical Shotgun was offered at a Rare level, while the Rocket Launcher and Silenced Pistol were at the Epic tier. There's actually a trick you can do with the Fortnite Vending Machines to make their loot items refresh. Each vending machine offers three items, as we stated above, one for each type of material you can offer to it. These three items are actually on a timer that refreshes every now and then, but you can get the Vending Machine to manually switch its three items by hitting it with your pickaxe. Doing this will completely refresh the three items on offer, and basically give you another shot at obtaining a more powerful weapon. Should Epic make any further changes to the way that Vending Machines function in Fortnite Battle Royale, you can be sure to read about it here. We might be all wrapped up for now on this Fortnite guide to the upcoming Vending Machines, but you can continue ahead to our Fortnite Mobile guide, for all the info you need to play the hit game on the go, or our Fortnite Week 6 Challenges guide for all you need to complete the latest challenges.